I love the way this card turned out. I won an amazing lot of blog candy from Tammi at Tropical Dreams blog (check out her blog she is an amazing crafter). All of the items on this card are the goodies I won. The paper is Basic Grey Mellow paper pack (I was never a fan of Basic Grey but this is the second paper pack I won and I love the stuff I'm addicting and need more). The snowflake is a Jolee sticker. The image is from Rachelle Ann Miller Skating. I used various color stickles on the ice rink floor and on their clothing (click on picture for a closer look). This week's Sunday Scrappin challenge is to Complete a gift item for someone else (card, page, whatever) and share the pattern/ details with us along with your finished project, just in case we're inspired to try your project ourselves. This is right up my alley, I have a lot of gifts to make. If you are a paper crafter (card maker, scrapbooker etc) we would love to have you join us at Sunday Scrappin. Hope to see you there. I made this card for Jeff's brother. This past week he took his family on vacation to Florida to visit his "girlfriends" family and while on vacation they got married. 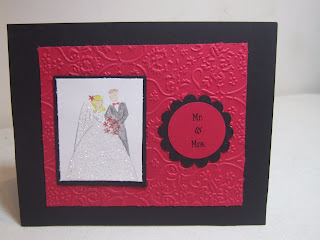 The card is made out of Black and run cardstock. The image is from SU to have and to Hold. 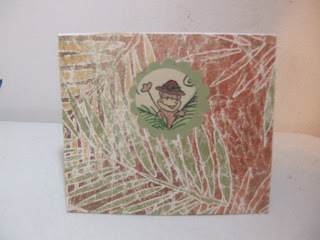 The background was embossed on the cuttlebug using the textile embossing folder. The scallop and circle are also punches from SU. I did the saying Mr & Mrs. on the computer. The brides dress is blinged out with SU dazzling diamonds. 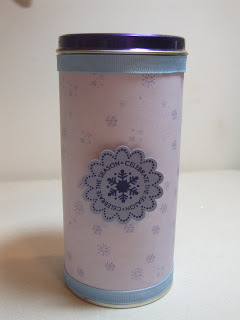 The other night I was in the store and saw these cute little tins, they are Royal Dansk Luxury Wafers. I thought these would make a cute little Christmas gift to alter. Heck with what the treat inside taste like the tin is perfect to alter. I picked up several. This is one of the designs I made so far. I have another idea also that I hope to work on hopefully later on this afternoon/evening. 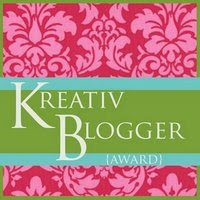 It's always such an honor to receive a blog award. 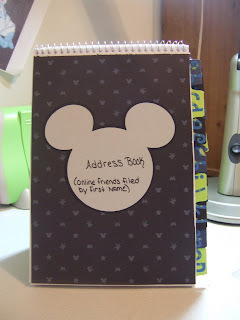 I received this word from an amazing crafter Dawn (you must check out her amazing blog) I hope to one day be able to attend one of Dawn's Stamp Camp get together, they make the neatest projects. There are so many creative crafters out there, I am amazed at all the creativity. You all inspire me so much! I appreciate everyone of your comments and your friendship. Thank you Dawn! This is the final Thanksgiving card of the year. I made this card for my friend Carrie and her family. The pattern paper and mat under the image is Basic Grey Mellow collection. Please keep Carrie's family in your prayers and thoughts. The family is going through a very difficult time right now. I wish them the best and hope this all passes soon. My heart goes out to them. Carrie and her brother Jay are the sweetest people. I will have another card and altered project to share over the weekend. 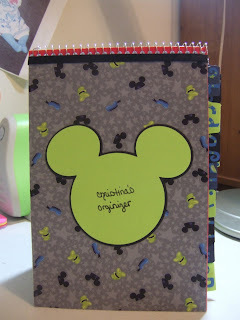 I made a mickey mouse planner. After seeing all the planners everyone over at Sunday Scrappin is making I had to make one too. I have a very hard time getting my handwriting centered. This planner is an address book, a list of birthdays/anniversaries (sorted by month) will be easier to flip to the Jan page and see all the bdays at once and remind myself to send cards, and a christmas card list. I still have to update the inside of it. 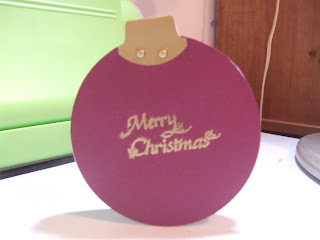 This is another one of the various ornament style Christmas cards I'm making this year. I have one more idea. This one I just embossed in gold the saying Merry Christmas. I am very excited tomorrow night we are going to WWE Smackdown wrestling. We have VIP seats I'm so excited. Jeff and I have a cold but that isn't going to stop us from going and having a blast! 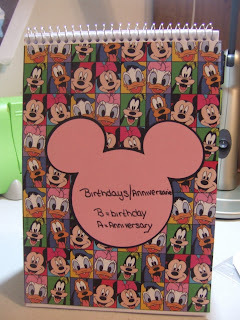 I was blog surfering tonight and came across an awesome blog called Scrap Creations. She has some of the cutest cards. She also is offering blog candy. The blog can be seen here . Be sure to check out her creations, they are so cute. I will be visiting her blog often for sure. I also came across another fabulous blog. She has some very creative creations on her blog. (Can say today is my lucky day with all these great finds not only with wonderful creative ideas but awesome blog candies too). This blog is called Passion for Crafts and can be seen here. Be sure to check out her fabulous creations while your there. I received a wonderful RAK (Random Act of Kindness) from my sister's friend Carrie. Carrie and her family are going through a difficult time right now and I do my best to help. Sometimes I don't feel as if my help is making a difference but this card proves otherwise. I cherish this card. I love anything homemade. 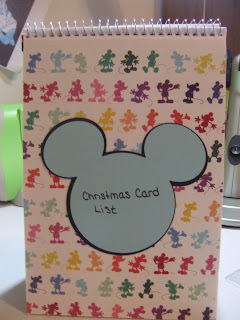 The card was signed by all the members of Carrie's family with little notes of thanks. It meant a lot and I will always cherish it. It's funny my sister comes to my house to raid my scrapbooking/cardmaking supplies and Carrie goes to my sisters house and raids her scrapbooking/cardmaking supplies. LOL! Happy Sunday Scrappin!!! This past week dragged it was a long long week. Next week will go fast Tuesday night we are going to a WWE Smackdown Wrestling Event (got 2 tickets for free - Jeff loves wrestling) and then Thursday is Thanksgiving. I didn't get much done this week because of my eye. Somehow I got a sty on my eye (from looking at the sky - joke I had to it all rhymes) and it got infected. OUCH!!! Be sure to check out the other creative post at Sunday Scrappin. If you do any type of paper craft (scrapbooking, cardmaking etc) we would love to have you join us. I received this pretty award from Forgetfulone. She is the sweetest person. She is always leaving the kindest messages on my blog. WOW 10 bloggers. 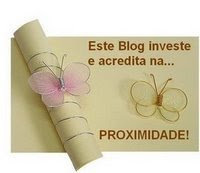 I surely do know more then 10 cool blogs but trying to think of them off hand. Yikes! 1. Baileysgranny - I am also in aww with her layouts and how much she gets done. 2. Christine My place in the Cali Sun - Love her sense of humor She always gives me a good chuckle. 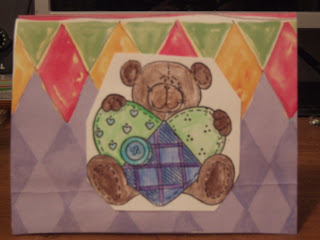 This lovely award was given by Kimmy from Stamps, Scraps n more. Each Sunday she has a new challenge posted on her blog, be sure to check it out. I have to pass this award onto 5 people. 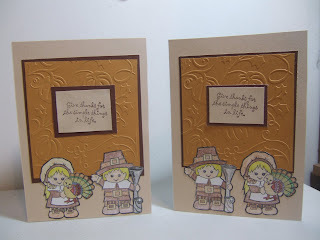 This week's Sunday Scrappin and Stamps, Scraps n More challenge this week was to make a fall card. On the first card I placed the pilgrims wrong I prefer the male on the left and the female on the right verison (just my preference). 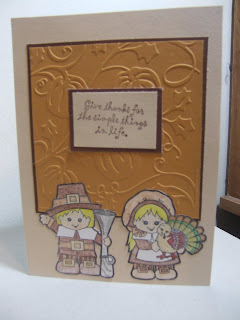 The middle piece was embossed using the cuttlebug Pumpkin Harvest embossing folder. I am going to leave this message at the top for awhile. There seems to be some confussion between my 2 blogs (craft blog and photo blog). If you are looking for My World, Sky Watch, ABC Wednesday, Today's Flower, or just looking for pictures please visit my other blog HERE. For craft posts (scrapbook layouts, cards, anything handmade) see below. Sorry for the confussion. It's Sunday Scrappin time!! Happy Sunday to everyone! It's been a hectic week, I've been sick with an horrible eye infection. I woke up Friday morning with my eye and part of my face swollen, the prescription the dr. gave me is working wonders. Be sure to see what fabulous creations the girls over at Sunday Scrappin created this week. I have started to work on my Christmas cards. I still have many more to make. These two santa cards are for our niece and nephew (thought they were cute kid cards). The image I received from SU WishRak it's High Hopes Santa & Rudy. 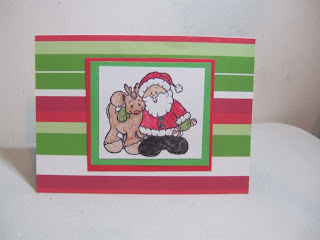 The pattern paper is by the Paper Studio Tis The Season Stripe and red and green cardstock. I think this is going to be the style of this years christmas cards. I have one other design I want to make but I need gold cardstock. The circles were made using the george cricut cartridge (the backing is plain cardstock same color as the front to hide the backing of the brads). 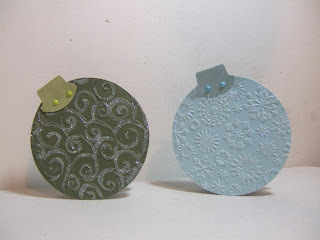 The top part of the ornament is a SU Round Tab punch. I may put ribbon through the tab but I'm not sure. May do a few with ribbon and few without ribbon. The front was ran through the cuttlebug then went over them with SU Dazzling diamonds glitter. 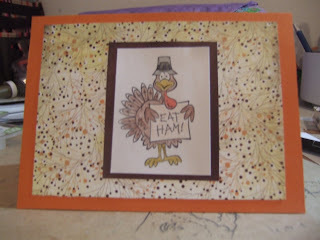 This weeks Sunday Challenge is Create something to do with Thanksgiving. 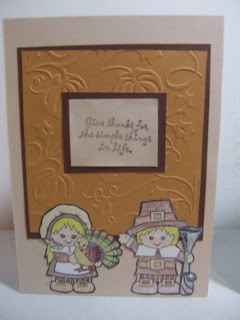 I thought I'd go easy and motivate everyone to get your cards, placecards, or other Thanksgiving crafts done This is the perfect challenge being I still have a few cards to make. I love this photo of our niece Summer age 3. She is adorable. 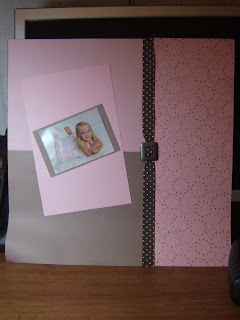 I made this layout awhile ago I was going to make a coworker a scrapbook for her first grandchild then decided against it and instead used the page for myself. I want to find small brown rubons and put her name on the top and year on the bottom (above the photo and under the photo). I usually can only find large rubons and never in the colors I need. I bought this dog stamp on ebay. It looks just like my dog buddy. 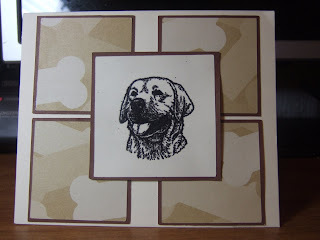 I heat embossed the dog image using black embossing powder. As I'm sure you know this will not be the last time you see this image. I will get plenty of use of those this one for sure. The image arrived yesterday and first thing this morning I was making a card with it. I received a sweet reward from Forgetfulone (be sure to check out our blog she is involved in some very interesting memes and besides that she's a sweetheart). I would like to all of my readers. 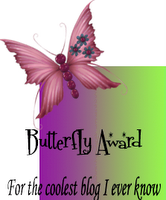 Please post the award on your blog (you all deserve it). 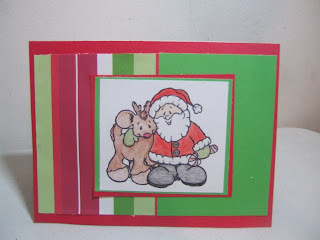 I made this card for this past weeks CupcakeCraft Challenge (new challenge starts Monday). This past weeks challenge was to make something with a hole in it. I made a small note card. There is no saying on the bottom for 2 reasons 1. I'm not sure if it will be a thinking of you or just a card saying hello 2. Not sure if I want the saying on the outside or inside (thinking the inside). Happy Sunday. It's a great Sunday, due to daylight savings time we had to change the clocks back and we gained an hours sleep, which is great being I went to bed late this morning. It's Sunday Scrappin time!! This is such a wonderful group of ladies and they are so talented so be sure to check out their creations. I can't believe I didn't do last week's challenge of using ribbon. I forgot about it. The funny thing was I was going to put ribbon on the Hang in there card but decided against it. This weeks challenge is to use a sketch from online or magazine. I should be able to do this, but then again I said that last week too. But I take part in several blog sketch challenges so I should get this one done. 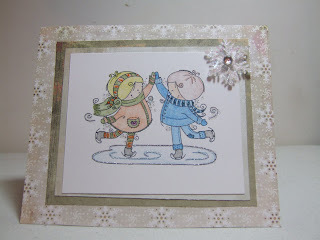 This card was made for this weeks Iheart2Stamp sketch challenge. I actually have another card idea that I plan to make either today or later in the week using this sketch. The stamp set is SU Sleigh Bells Ring (I believe this set is retired). I used gold embossing powder for the saying. 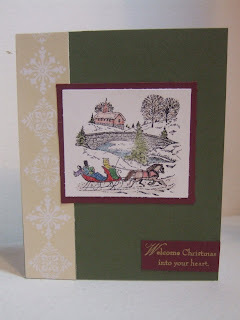 I love to do all types of embossing whether it be heart or dry embossing or embossing with the cuttlebug.